The 2007 Alien vs. Predator (AVP) film might have sucked in many fans’ eyes but one thing that didn’t was some of the awesome creature design – designs like this Elder Predator Ceremonial Mask..
Now, Sideshow Collectibles in partnership with Amalgamated Dynamics Inc (ADI) are bringing this Predator Ceremonial Mask to a limited number of collector’s homes with this brand new prop replica set for release in April 2013 (and also May with some vendors). Each prop replica is an exact 1:1 reproduction of the original screen used prop, as created by ADI. Cast in fiberglass, each piece is individually painted and finished to exacting standards, each with its own unique quality and detail. Limited edition of only 750 pieces world wide. 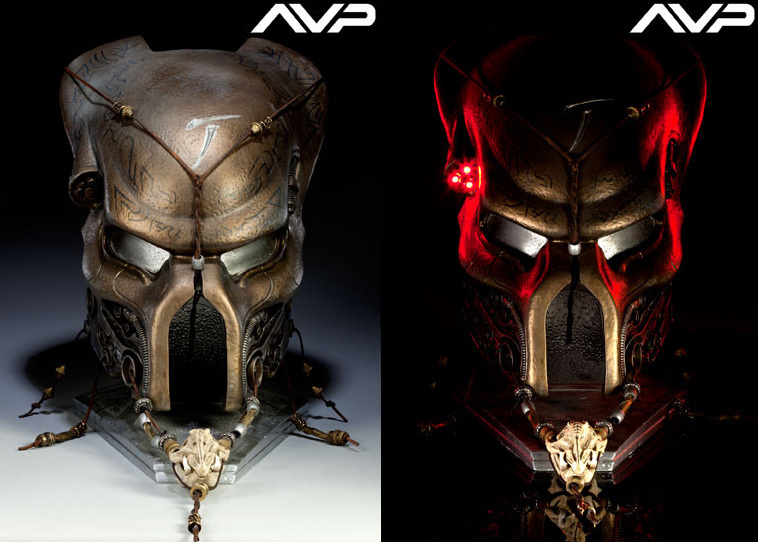 During a hunt, the Predators wear a technologically advanced mask that offers protection and adds to their sensory abilities. The mask is equipped with multiple vision modes, including night vision and thermal vision. Fellow warriors appear white while targets appear red or green. Predators can use the mask as a targeting device, zooming in on their prey for precise kills at long range. 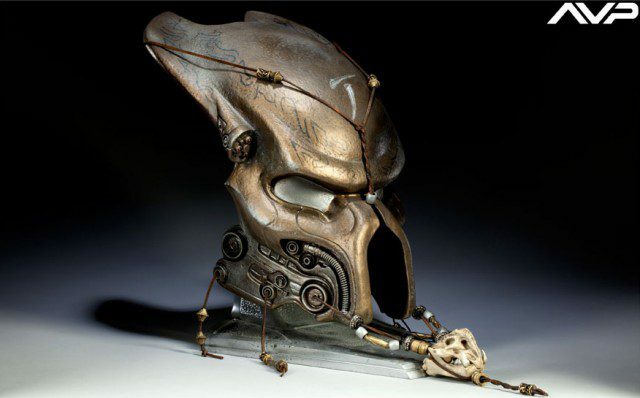 Protecting the Predators, the mask acts as a pollution filter while shielding their flesh from the acidic blood of the Xenomorph aliens and the weapons of interfering humans. They also use Ceremonial masks during their rituals. These masks are ornately decorative, rather than technologically enhanced. Those who have illustrated superior battle or leadership skills are distinguished as Elder Predators. Elders’ armor, clothing and masks differ from those of other Predators to show their authority, and their hunting abilities are believed to far exceed those of the common members of the Predator species. 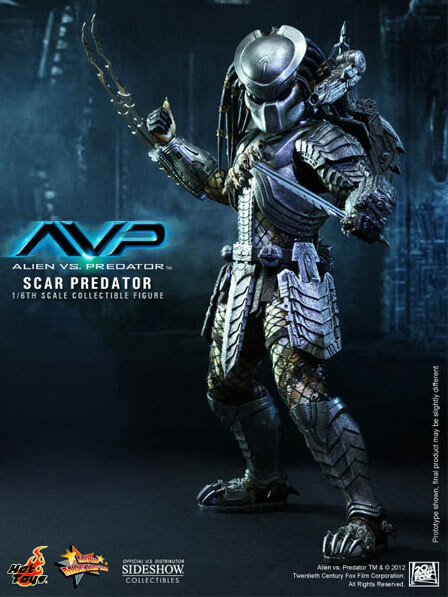 Coming in May 2013 is Hot Toys’ Movie Masterpiece Scar Predator Sixth Scale Figure based on the Scar Predator seen in the 2007 film Alien vs Predator . This is a movie-accurate Scar Predator collectible based on his image in the movie. It’s a limited edition item though of how many I don’t yet know. It’ll cost you $239.99 or you can grab it using a $78.33 per month arrangement. This is an auction for a Limited Edition Hand-Made Brooding Aliens vs Predator Porcelain Tile. This particular one is a legitimate first edition Sideshow Collectibles prototype, numbered 19 of 250. Comes with actor Lance Henriksen’s signature etched in the back. 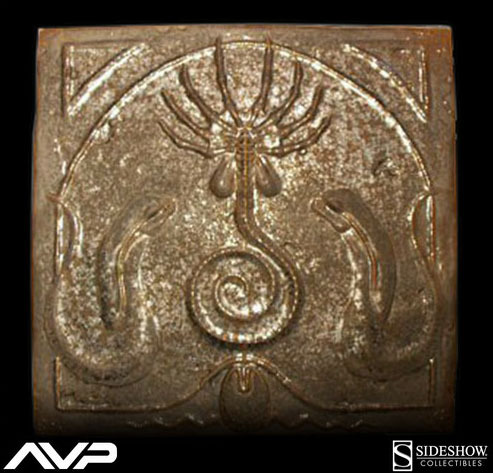 This auction is for a truly unique, extremely limited, bronze finished porcelain tile featuring a relief of the eight-legged Facehugger and Chestburster aliens from one of the most iconic Sci-fi creatures of all time! 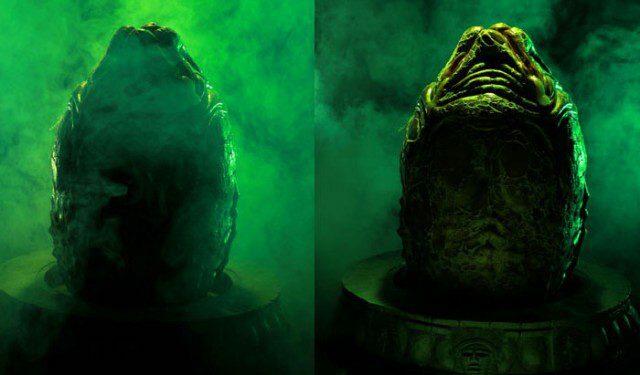 The piece of art is doubly unique as it was created by Lance Henriksen, who also had roles in both films, Aliens and Aliens vs. Predator. It is approximately 12” x 12” x .5”. The tile comes in its original craft box with one color printing and certificate of authencity. Additionally, all proceeds from thise unique auctions will go to local Southern California cancer causes and national children’s charities!